Can't get enough of LG's music and shows? Here's your chance to become a part of her private circle of worldwide fans. 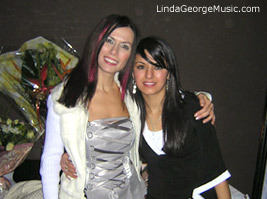 Learn about Linda George's career, video projects, tour information, and much more! You will also receive photos exclusively made available for the LG Fans via her "From LG with Love" emails to her fans. There are also exclusive interviews, LG's personal essays, contests, member letters, and ways for you to network with other LG fans from around the world. Be sure to update your membership info periodically. Do you need to update your personal information? Send an email to fans@lindageorgemusic.com with your profile update. Whenever you have any updates in your profile, please send a mail to fans@lindageorgemusic.com with your profile update. All areas marked with * are required.